Caricatures for Parties & Events! (within 200 miles of Burbank, CA)! At most parties, I usually stick to drawing the Head & Name, Black & White drawings on 11″ x 14″ paper (you can find frames that size everywhere), and will include the names of the person(s) depicted. Drawing that style of caricature, I can draw about 20 people an hour. My RATES are: 1 Hour for $140 ~ 2 Hours for $240 ~ 3 Hours for $340 ~ 4 hours for $440 ~ 5 hours and up is a flat $100 per hour. Note: At most parties, I do put a tip jar on my table. Would you be willing to add “Full Bodies and Backgrounds” to the drawings? Yes. With bodies & backgrounds (in black & white) I can draw 6 to 15 people per hour. Would you be willing to add “Full Color” to the drawings? Yes. I can draw 4 to 10 people per hour in full color with head and name only; I can draw 3 to 5 people per hour in full color with bodies and backgrounds. A suggestion: If the event is centered around specific people (birthday, anniversary, wedding, etc. ), I can draw a full deluxe color body & background caricature of the guest(s) of honor, and then draw everyone else there in the standard Head & Name / Black & White way. I can draw this caricature before the event for an additional fee if you can e-mail me current photographs of the guest(s). Can there be more than one person in each drawing? Yes. The Head/B&W drawings can be done with as many people as you like in each drawing, as long as the people being drawn realize that they are only getting one copy that they have to share (the artist gives full permissions to photocopy). Dating / Married couples usually go for this, as do families. What if I book you for a certain number of hours, and at the event when that time is up, I’d like you to stay longer and continue drawing more people? Are you willing to stay longer than we originally booked you for? As long as you pay me for the extra added time (my rate for that being $100 per hour), and as long as I do not have any other engagements to get to following the event, then yes, I am very willing to stay longer than the time we originally booked. Pretty darn far. However if it’s more than 200 miles away, I may also need you to pay an extra $40 travel fee to cover my extra fuel costs and provide me lodging for the night at a local hotel. Normally, you pay me at the event sometime before it ends. If for some reason you need to pay be before the event, we can do that as well. I accept cash, checks (payable to “Luke Sienkowski”), and I am also able to take credit card payments via PayPal, Square, Venmo, and Cash App. How do I book Luke Ski for an event? Email me at thegreatlukeski@gmail.com! My schedule is always busy, so the sooner you can get a hold of me and start the booking process, the better. It’s never too early to set things up, so even if you’re just considering it a possibility, it’s probably best to e-mail me right away and ask if I am available for the date of your event. If you prefer to talk to me over the phone, leave your phone number in your e-mail (and the best times for me to call you there) and I will call you as soon as I can. INDIVIDUAL CARICATURES: My rate will depend on four factors: 1.) How many people are in the drawing, 2.) Black and White or Color, 3.) Head & Name or Full body & Background, and 4.) the amount of extra details you request (if any). You’ve seen examples of my caricature work in my gallery above, which should give you an idea of how detailed I can get. Email me at thegreatlukeski@gmail.com and describe the type of caricature you want, and I will give you an estimate for your piece. Black and white pieces start at about $20, full color pieces start at about $50. This includes the cost of me shipping you the finished 11 x 14 artwork in a mailing tube. 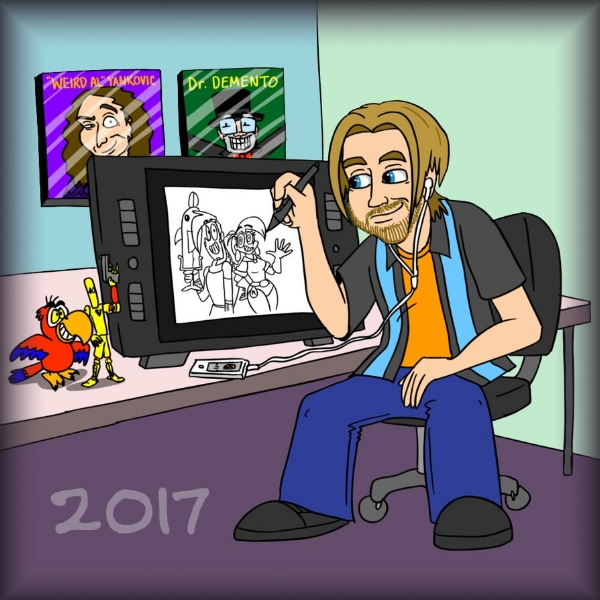 CARTOONING & OTHER ART: In my cartooning style, I’ve done numerous album covers, promotional ads, t-shirts, comic projects and much more. See the gallery below for examples of my work. My starting price is $100.00, and it will go up from there depending on how much time will be spent on the project, and how difficult and detailed it is. Email me at thegreatlukeski@gmail.com with a description of the project you’re interested in having me do, and I’ll get back to you with a price quote. “MIGHTY MAGISWORDS” FAN ART AND O.C.s: I was a Storyboard Artist on Cartoon Network’s “Mighty MagiSwords”, as well as the voices of Skullivan, Cattus, Docky, and more! If you’re a fan and would like me to whip up a piece of MagiSwords fan art for you with your favorite character(s), and/or would like me to draw your own Original Character, I would be happy to oblige. Again, my rates will depend on exactly what you want, how many characters, how much detail, etc., email a description to me at thegreatlukeski@gmail.com. Black and white pieces start at about $20, full color pieces start at about $50. Payment in advance via PayPal or another method for freelance art. To contact Luke Ski, email thegreatlukeski@gmail.com, or fill out this form below. Thanks for visiting! Luke Sienkowski was encouraged to draw at a very early age by his mother Caroll, an art teacher. Inspired by comedy of Jim Henson, the wonder of Walt Disney, and the art styles of Charles Schulz and Matt Groening, he became a self-taught cartoonist, spending his teenage years drawing his own comic strips and comic book adventures. Luke attended the four year fine arts college the Kansas City Art Institute where he received a Bachelor of Fine Arts Degree in Illustration. After spending a summer learning the caricature style at a local theme park, he went out on his own as a freelance artist, opening his own caricature stand at Station Casino Kansas City (1997-2000). After moving back to his home state of Wisconsin, Luke continued to work as a freelancer and caricature artist, both for parties and individual orders via the internet. Later when he moved to the Chicago area, he could often be found drawing caricatures at his stand at such area attractions as the indoor waterpark resort Key Lime Cove (2008 to 2012) and downtown at the world famous Ed Debevic’s restaurant (2005 to 2015). Luke recently spent 3 years working at Cartoon Network as a Storyboard Artist on the comedy/action show "Mighty MagiSwords", where as well as writing the jokes and drawing the gags of the series, he also got to be a voice actor and play a few of the characters, such as Skullivan the skeleton man, Docky Boardman the sailor, Cattus the nomadic cat warrior, and many others. Luke is currently looking for a Storyboarding position on other animated TV shows produced in the Burbank / L.A. area. 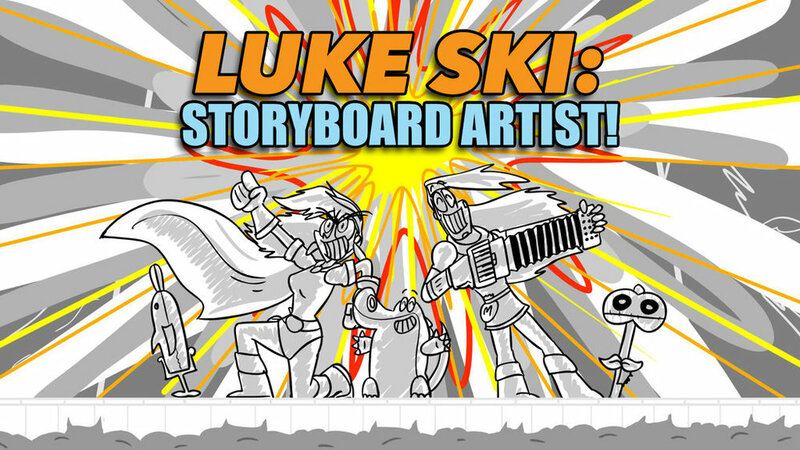 His Storyboarding work can be seen at http://www.luke.ski . “Mighty MagiSwords” can be seen on Hulu, Amazon, iTunes, GooglePlay, and YouTube. Luke is a pop-culture junkie, staying on top of the popular movies, TV shows, video games, and cartoons people love, and he LOVES incorporating those things into his full-body caricatures. His other hobbies include making comedy music for the legendary (formerly radio) streaming internet audio program "The Dr. Demento Show"! He has performed his act at sci-fi conventions and other eclectic venues all across the country. You can hear his nerdy funny tunes at http://lukeski.bandcamp.com .